When the temperature drops below 75 degrees in south Louisiana, gumbo season commences. Even though I’ve long left Louisiana, my roots are there, so I continue to make gumbo each October here in Utah. I have a passion for this dish and the culinary tradition behind it, and both are meant to be shared. 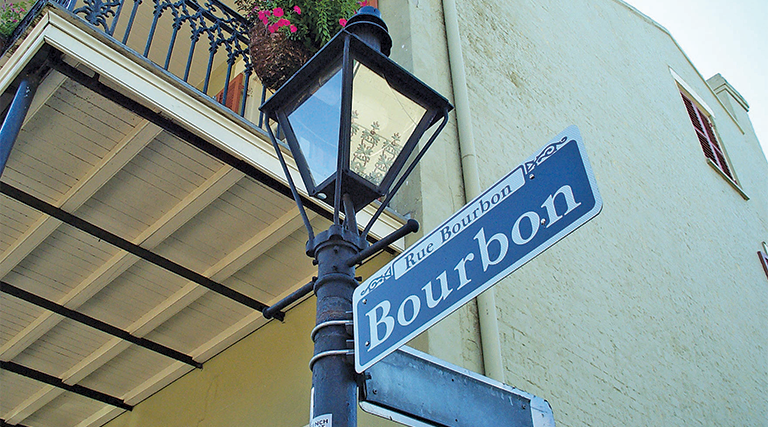 Not a soup and not quite a stew, gumbo is in a category of its own. 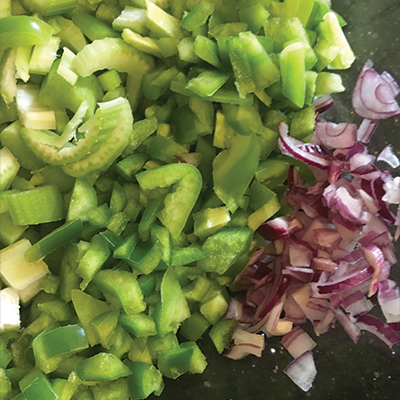 For as long as I can remember, autumn marked the time I’d be awakened by the distinctive smell of the roux’s nutty, burnt-toast aroma, followed by the sizzle and steam of onions, green pepper, celery and garlic that infused my home on Saturday mornings. As a child, I assumed that everyone ate this way, not realizing what a unique tradition it was. I learned to make gumbo watching my mother stir a bubbling pot growing up in the southern Louisiana town of Gramercy. The recipe varied, as it utilized what we had on hand. I learned that gumbo is more about the love and patience put into the dish—it’s the stirring, browning and layering of ingredients and the flavors that meld together. The great part about gumbo is that, much like soup, after you’ve done all the hard work of chopping, stirring and assembling, you can let it simmer for a couple hours while you go about your business. Cook it on a cool day with your windows open. 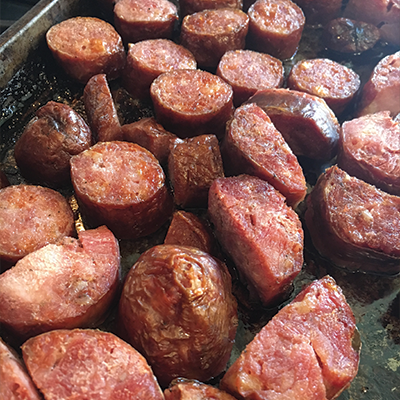 The recipe I’m sharing recalls my youth in the River Parishes, where men traditionally hunted, made their own sausage and andouille, and cooked the gumbo (men cook gumbo in my culture, almost more so than women). Cooking gumbo involves four distinct processes—making the roux, broth, vegetables and meat (or seafood). 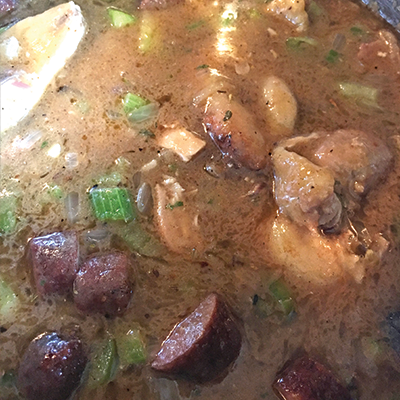 This traditional chicken and smoked-sausage gumbo is not thickened with okra but with filé at the end. You can feed a crowd with this recipe. It’s also wonderful at tailgate parties. I actually prefer it as a leftover, plus it can be easily frozen and saved for another occasion. The secret of a wonderfully deep and rich gumbo is the roux. It can be easy to make, but there’s only one rule: You must stir it constantly. So, prepare all the vegetables and meat for your gumbo in advance to be ready to assemble quickly. Have at least one quart of hot water ready in a kettle and hot broth ready to go. Before or while you’re making your roux, brown the seasoned chicken parts and brown the sausage on one side so there’s not too much oil in the gumbo later. 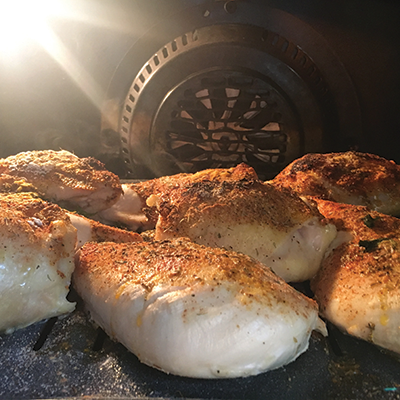 I do this by broiling in the oven on a rack for 20 minutes. Turn off the phone—yes, completely off. 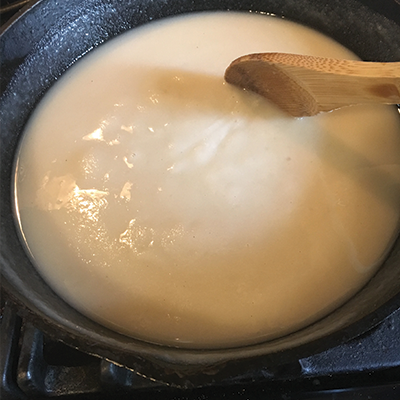 You’ll need to stir your roux continuously for at least 20-30 minutes. It’s the only rule! sides and surfaces of the pot. be hot and bubbly, so be careful. Keep stirring. 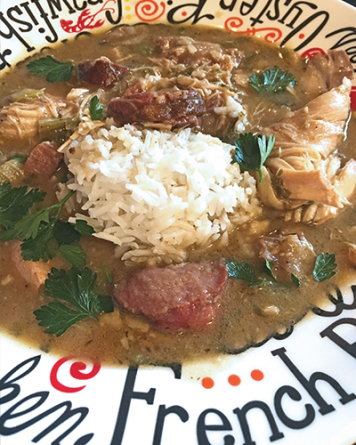 the color of milk chocolate which is ideal for this gumbo recipe, but in the River Parishes, a caramel color is traditional. 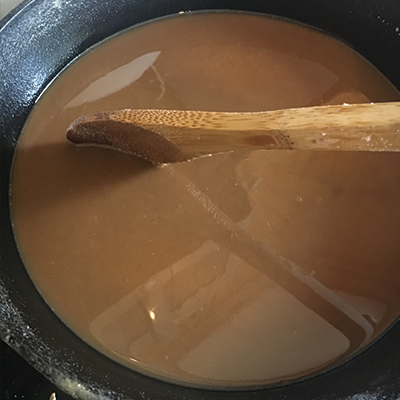 In the swampier parishes, the roux is darker—nearly that of dark chocolate, but be careful not to burn your roux. Stir, stir, stir! If the roux gets brown or black bits in it, you’ll have to toss it out because it will ruin the flavor. It means you have burnt pieces in your roux. Start over and stir reaching every corner of the pot constantly. Add vegetables, herbs and protein. 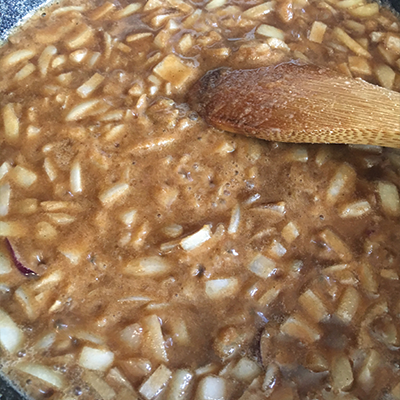 Once the roux is ready, add the onions and fry until soft and clear. 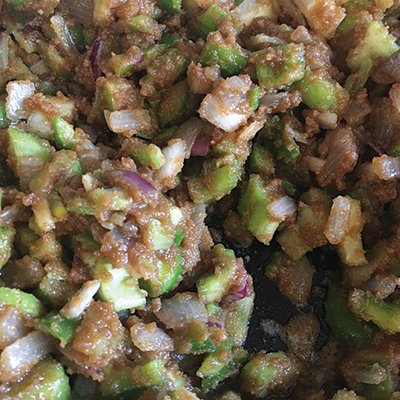 Add celery, bell pepper, garlic, cayenne pepper to taste, sausage, salt and pepper to taste, and a splash of wine or apple cider vinegar. Add broth to this mixture along with thyme and bay leaves. much or the chicken will fall apart. Adjust thickness by adding more broth or hot water. You can adjust seasonings at this time as well. Serve the gumbo in shallow bowls over mounds of hot white rice along with a bottle of hot sauce at the table. Top with filé (pronounced fee-lay), which is ground sassafras leaves. Recipe will yield 4 ½ quarts or 10 servings. Double ingredients for a bigger party. Sides for gumbo: green salad, potato salad and garlic bread. We serve gumbo over rice and also with potato salad. It might sound strange, but a dollop of cold potato salad in hot gumbo is absolutely delicious. Give it a try and let me know what you think. n all-beef smoked sausage from the local market, but don’t add liquid smoke to your gumbo! the gumbo after serving. I find that cooking with filé gives sauces a bitter taste, and I don’t care for it. advance of the Christmas Eve bonfires on the levee.